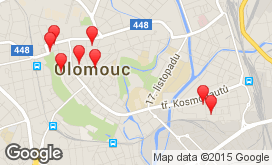 Make Olomouc a Base for Your Business! Located strategically in the heart of Europe, the City of Olomouc boasts its university, superior infrastructure, good scientific and entrepreneurial environment, and high level of education. Olomouc is the sixth largest city of the Czech Republic with the population of 100,000 and over 24,000 university students. Once the capital of Moravia, it boasts a rich history, the second oldest university in the country, and second largest Urban Conservation Area, next to Prague. In recent years, internationally renowned R&D centres have emerged here, as well as industrial and commercial areas, office complexes, top hotels, residential quarters and leisure time areas. Due to its unique atmosphere, the city is praised as one Europe’s hidden gems and has become a popular venue for international conferences, exhibitions and festivals. The natural hub of the region; major road and railway junction linked to main motorway routes (Prague / Brno – Bratislava / Vienna / Ostrava / Katowice - Krakow); centre of the Olomouc conurbation (Olomouc – Prostějov – Přerov). Excellent level of education , available workforce and favourable level of labour costs; important role of vocational schools, Palacký University and private colleges; high-quality language education: a wide range of foreign languages taught at the University; multilingual secondary schools; an English elementary school offering international curricula. Long tradition in engineering & pump industry, food processing, and chemistry; new industrial zones attracting automotive industries, precise engineering, electric engineering, and printing industry; dynamic development of services, commerce, and logistics. Strong tradition and background in building industry; development of business zones for domestic and foreign investors; high-grade infrastructure. Excellent location for shared services centres, customer support centres, data and R&D centres, and other outsourcing companies; state-of-the-art office centres; flexible workforce with outstanding language skills. Skilled workforce and a wide choice of developed plots and manufacturing halls for rent, suitable primarily for investors focused on sectors where natural sciences have prominent place, but also for other branches of light industry. Opportunities of cooperation with top university centres through the agency of the Palacký University Science and Technology Park; start-up support to innovation enterprises; active clusters. High-quality congress venues and accommodation facilities; perfectly located and easily accessible historical city with unique atmosphere: the city is praised as one of most beautiful tourist destinations, offering numerous opportunities to visitors, tourists and tourism enterprises. Attractive surroundings and the region’s capital infrastructure offer the local citizens a high quality of living in terms of housing, education, health care, social assistance and a wide range of cultural, social and sports events. The staff of Olomouc’s City Hall Division of Economic Development will gladly provide you with information about the local entrepreneurial environment and opportunities for your company. We are looking forward for your visions!